You did what to your wart???? It continues, as another poster replies and instructs him on how he should have done this over a paper bag and then burned the paper bag to reduce contamination and contagiousness. They instructed the asker to 'make it bleed' as this give you a 'better healing response.' Another generous soul then recommended the asker cover the lesion with nail polish to starve the wart of oxygen. I truly hope that it is not my expertise that tells me this is terrible advice! This advice is wrong on so many levels. The bottom line is that ANY bothersome skin lesion that changes over time or does not resolve in a period of weeks needs to be assessed by a trained professional. Dermatologists look at skin lesions day in and day out, but are still sometimes surprised to find that lesions they thought to be benign ended up being malignancies (cancer). Furthermore, to probe or cut a skin lesion on your own can cause bleeding (sometimes excessive), scarring, infection (whether you use 'antiseptic' or not) or even spread cancer if it exists within a lesion. If a skin lesion is present on the feet or ankles, go see a podiatrist or dermatologist. If there is any question of what the lesion is after a pair of trained eyes has assessed the lesion, it will be biopsied to definitively identify it so that the appropriate course of treatment can begin. DO NOT cut into your own skin in attempts to remove a lesion. DO NOT put nail polish on a bleeding or previously open bleeding wound. 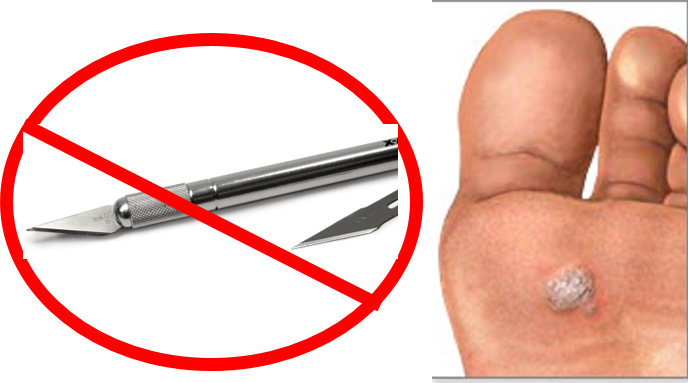 DO NOT poke a skin lesion with safety pins! Something small can become a big problem and something that seemed small may turn out to have been anything but. Peruse our blogs and FAQ's on skin lesions and warts to learn more or make an appointment today if you have something on your foot or feet that is bothering you.